Lesson 1: [Video] How to create a strong (or stronger) foundation for your clinic business. How to identify where your patient referrals are coming from (or should be coming from). How to become a profit center for the hospital. 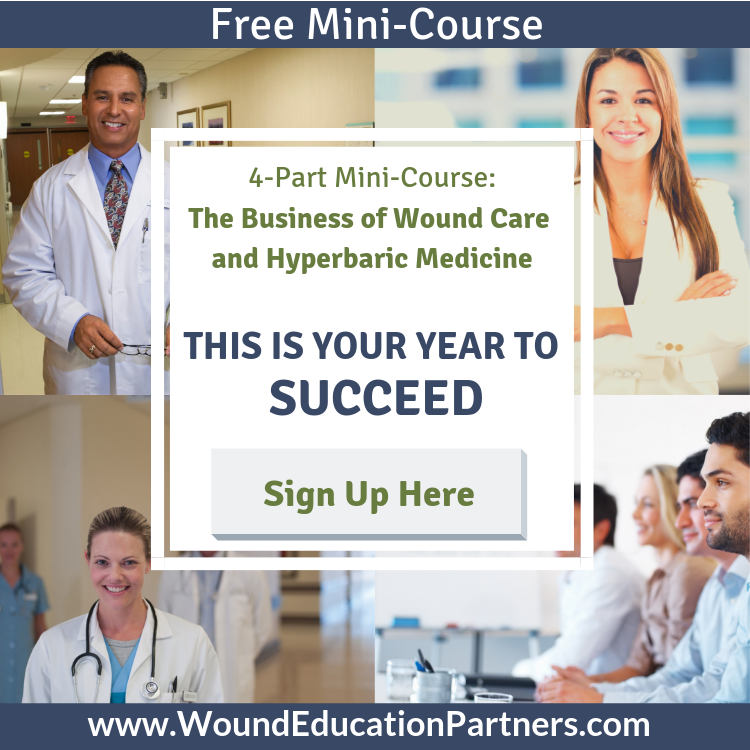 Lesson 2: [Video] The explosion of chronic wounds in the U.S. and the opportunity for wound care and hyperbaric medicine clinics to serve more patients. Lesson 3: 4 Easy steps to market your clinic. Lesson 4: How key are front office operations to the wound clinic business? Learn the two key considerations for creating efficient front office operations that contribute to the achievement of your clinic's overall financial goals. In this three-part video mini-course, you will learn how an Introduction to Hyperbaric Medicine basic training course will benefit your patients and expand your clinical expertise. Dr. Helen Gelly MD, FUHM, FACCWS, UHM/ABPM, Medical Director for Wound Care Education Partners, and one of the world's foremost physician educators of Hyperbaric Medicine discusses the topics covered in the 4-day, 40-hour Introduction to Hyperbaric Medicine course, and how the course material directly applies to your clinical practice. Video 2: Hyperbaric Medicine Mechanisms of Action - in this 13-minute video mini-lesson Dr. Helen Gelly describes the mechanisms of action in hyperbaric oxygenation. Video 3: How to Earn the Necessary Hyperbaric Continuing Medical Education Credits (CMEs) to Meet UHMS Accreditation Requirements by Dr. Helen Gelly. This comprehensive 2-day live course provides participants with the required tools for effectively carrying out the role of safety director. This program benefits those new to the safety director position by orienting them to the responsibilities as defined by the NFPA, UHMS and other organizations. In addition, the course is a great review for current safety directors and seasoned technicians by providing updates to NFPA code and industry standards. This course is intended for a wide audience of health care providers involved in the provision of hyperbaric medicine, including the registered nurse, certified hyperbaric registered nurse, nurse practitioner, clinical nurse specialist, registered respiratory therapist, certified hyperbaric technician, physician, physician's assistant, EMT’s and paramedics. The main goals of the course are to review hyperbaric safety and emergency procedure development. This is an intense four day course approved by the UHMS & NBDHMT as an Introductory Course in Hyperbaric Medicine and intended for a wide audience of health care providers involved in advanced wound care management, including the physician, registered nurse, nurse practitioner, clinical nurse specialist, registered respiratory therapist, physical therapist, physician's assistant, EMT’s and paramedics. The goals of this course are to provide an understanding of the physics involved in increasing the pressure in a fixed volume environment; provide an overview of the physiological effects of hyperbaric oxygen and the pharmacological role oxygen plays in hyperbaric medicine; review the history of hyperbaric therapy; review the various types of hyperbaric systems in use today and regulations involved in maintaining a safe operating environment; gain an understanding of the organizations that serve as resources for the field of hyperbaric medicine and lastly, review the UHMS indications approved for treatment in the hyperbaric environment, review the safety standards for operating the equipment and understand the requirements for documentation for compliance and payment.